faithhaller.com: Hair Update: WOW! How Did you get your hair to grow so fast??? Hair Update: WOW! How Did you get your hair to grow so fast??? I know this question was asked when looking at other peers hair. Well the answer to that is there is not magic or spell that I can give you that will answer that question. The goal to fast growing hair is to maintain your hair. Wash and condition your hair weekly. Personally I co-wash which is one reason my hair grows because I'm putting moistures into my hair whether then stripping the moisture. I probably shampoo my hair 1-2 time a month really it all depends on the need. Only you would know that. I moisturize and seal my hair daily. I detangle my hair daily. And there are things I use to promote healthy hair and growth such as Castor Oil, Coconut Oil, Tea Tree Oil, Peppermint oil and olive oil are one of my main oils I use mainly being Castor Oil. Another product that I consider a staple of mine is Glycerin. If you would like to know more about glycerin, read my article and how I use it on my hair Africare 100% Glycerine. This stuff has brought me through some hard times. 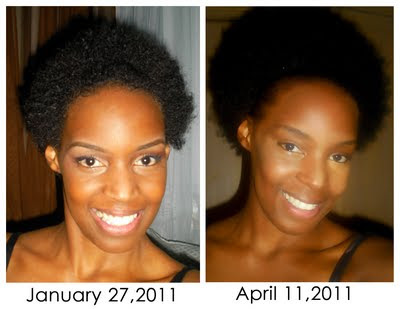 In order to keep your hair healthy and to get it to grow you must and I repeat YOU MUST be consistent, with your regimen. What ever works for you keep doing it. It's ok to add to your regimen but don't navigate away from something that works. If you see results with something it's best to keep it. Here are my results for my natural hair journey. CONSISTENCY WORKS!! !